Home Remedies For Acne Scars – Get Back A Flawless Skin Within No Time! Acne scars can damage your self-esteem! But, only until you realize that they can be treated and you can regain your soft and healthy baby skin back! The magical ingredients are hidden right in your kitchen shelves and all you need to do is collect the right ones to prepare the perfect list of home remedies for acne scars. If you are looking for treatments other than the natural remedies, you can scroll down to find some best acne scar treatment methods that are commercial! Before jumping into the action right away, let us exactly know what causes acne scars so that the natural treatment gets much easier. It is only the inflamed acne that can lead to acne scars after they have healed. This is because infected and inflamed acne can damage the most important layer of the skin, the dermis where there are blood vessels, nerves, collagen and oil glands. When the pus from the infected acne leaks into the surrounding tissue, the healthy cells get damaged and our body tries to repair this damage by building collagen which then causes the scar to show up. So, it is usually advisable to avoid scratching or squeezing the pimple so that the pus does not spread into the nearby healthy cells, eventually leading to the formation of scars. Home Remedies For Acne Scars – Top 7 Powerful Ingredients! Natural remedies for acne scars can work effectively because of the vitamins and antioxidants present in them! Fortunately, almost all these ingredients are commonly available in our households! So, all you need is a few weeks of consistency and commitment to not miss the most important part of your skin care regime, which is the treatment of your skin with some of these natural remedies at least thrice in a week! Ensure that you follow these remedies only if our acne is no more infected, pus-filled or inflamed. A sudden rupture to the infection definitely worsens your condition. The following tips are applicable if your skin is all even without any raises, bumps, cysts, pustules or infected zits and with only with visible scars or spots! All the credit of healing property goes to a medicinal component called curcumin present in turmeric! Mix turmeric and honey well until a smooth mixture is formed. Apply the face mask all over your face and massage it well in the area where scars are visible. Use your forefingers to gently rub and press the affected region! Let the mixture remain on the face for half an hour to forty-five minutes after which you can rinse your face with clean water and pat dry. Follow the remedy twice in a week for best results. 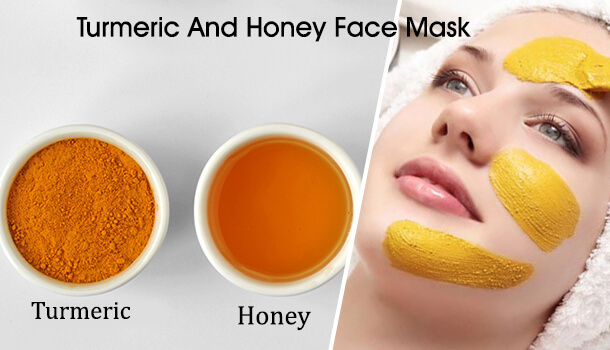 Do not add excess turmeric while preparing the face mask as this can leave a yellowish tinge on your skin even after a proper cleansing! 2. How To Remove Acne Scars Using Virgin Coconut Oil? Coconut oil is definitely a best and natural remedy to get rid of acne scars but before knowing how the oil actually works on your skin, ensure that you choose only virgin coconut oil and not refined oil. Refined oil is processed much which makes it less flavoursome, devoid of natural fragrance and it also strips off the biological components from the oil. 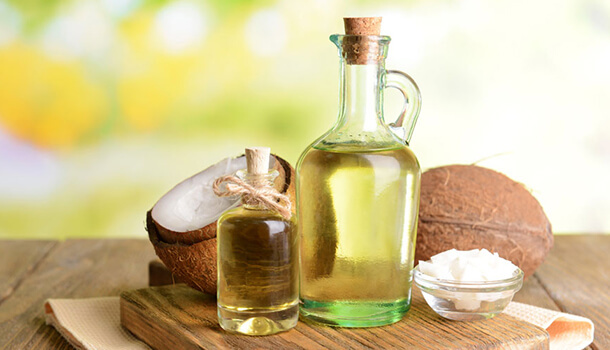 Virgin coconut oil, on the other hand, is pure with its natural scent and is rich in antioxidants and vitamin due to the natural method of extraction. Coconut oil can boost the production of collagen which is very much essential for the process of wound healing and the reduction of scarring. Take a few drops of coconut oil into your hands and rub it along your palms. Massage the oil onto the affected area with your fingertips until you feel that the oil is deeply embedded into the pores. Continue massaging for 15-20 minutes and leave it aside for forty-five minutes to one hour. Rinse it off with water, using a skin-friendly face wash.
Can You Apply The Oil Overnight? If you bear an oily skin type, it is better to avoid the application of coconut oil overnight since it can clog your pores, leading to the formation of blackheads, whiteheads and unwanted zits. You can try the remedy as a part of your daily skin care regime, a half hour prior to your regular bath. Tomatoes are a great source of antioxidants. One major plant pigment that is responsible for imparting the bright red colour to the vegetable is lycopene. 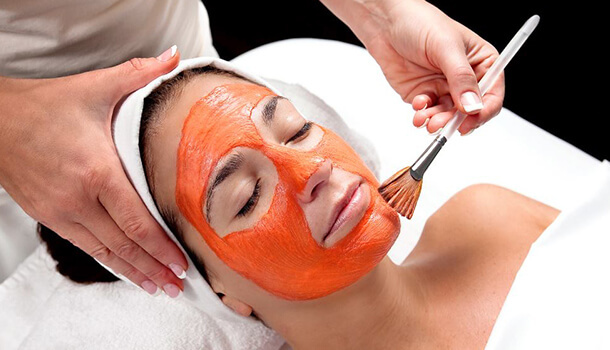 You can either rub your skin with a tomato slice or prepare a tomato face pack! Rub Your Skin With Tomato Slice! Cut the tomatoes into a few slices. Take one of these slices and rub it on the affected area for 15-20 minutes in a circular motion. Let the pulp of the tomatoes remain on your skin for one hour after which you can rinse it off with lukewarm water and pat dry. You can also peel the outer layer, mash the tomatoes and mix it with fullers earth to make it a smooth paste. Apply the paste all over your face and let it remain for one hour! Ensure that you rub and massage the mixture well into your skin pores. Rinse your face with water, pat dry with a clean cloth and apply a good moisturizer. You can prepare a healthy tomato soup or prepare a fresh tomato smoothie to enjoy the best benefits of tomatoes which are the best and natural remedies for acne scars. Make sure that tomatoes are included in your diet more often (at least thrice in a week). Though there is no exact scientific evidence to prove that egg white can completely heal the acne scars, it is known to shrink the open pores and bind the skin together which is why egg white makes one of the best home remedies for acne scars. The best part of utilizing egg white as a natural remedy is that you can mix it with other ingredients like lemon which can fight the pigmentation, dark spots and even out your skin. Carefully, extract egg white from one medium-sized egg. Squeeze half slice of fresh lime into the egg white and mix this well. Use a smooth bristled brush or your forefingers to apply the mixture on the scarred region and keep rubbing it in a circular motion until you feel that the mixture has gotten embedded into your skin pores. 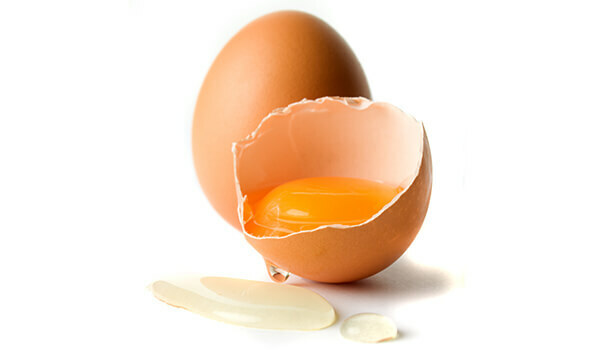 Leave the egg white and lemon mixed face pack on your skin for half an hour until it gets totally dried up. Rinse your face with clean water, pat your skin dry and apply a skin-friendly moisturizer! Follow the remedy at least twice in a week for one and a half month to obtain the best results. 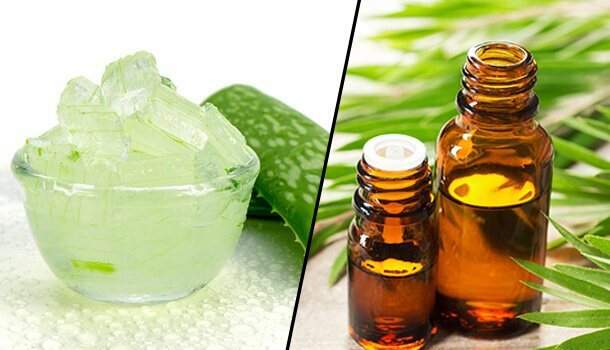 Aloe Vera and Tea tree oil are individually great wound healers because of the biological components present in them. Extract one tablespoon of Aloe-Vera gel from the Aloe leaf and add 2-3 drops of tea tree oil to it. Mix both the ingredients well and apply it on the area where scars are evident. Rub it deep into your pores with your forefingers and leave it as such for half an hour or until you feel that the mixture has completely dried up. Rinse it off and apply the suitable moisturizer. Try to follow the remedy twice in a week to experience the best results. Apple cider vinegar can also act as an anti-inflaming agent so as to soothe the redness and provide a soothing effect. 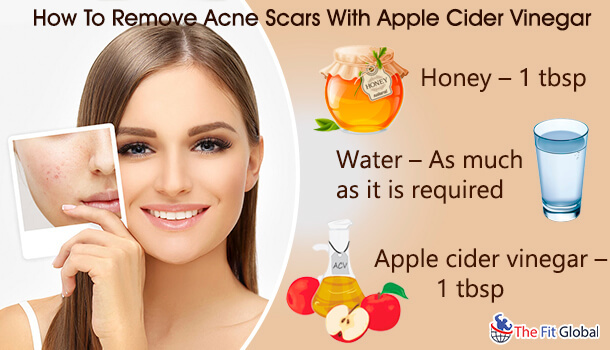 If you are looking for the natural acne scar treatment, a mixture of honey and apple cider vinegar is the best one you can choose to follow. Mix all the above-mentioned ingredients to form a smooth paste. You can change the quantity of the ingredients but ensure that you finally get a paste that is semi-solid in nature so that it is convenient to be applied as a paste. Apply a fine layer of the paste all over your face, ensuring that you rub and press the mixture into your skin. Let the mixture get completely dried up after which you can rinse it off and moisturize your skin. If you have been using baking soda as a common ingredient to prepare various foods, this is also a going to be your beauty ingredient from now on. The chemical is also anti-inflammatory in nature which can soothe the redness and itching sensation of you have any. Ensure that you do not use baking soda on a daily basis for treating your skin since it can be harsh and roughen your skin. Take a tablespoon of baking soda and mix it equal quantities of water. You do not have to apply the paste all over your face. You can simply apply it over the affected area and leave it for 15 minutes. Ensure that you do not let the paste exceed the time period of 15 minutes. Rinse it off with cool water and pat it dry. Do not forget to moisturize your skin since baking soda may cause excessive skin dryness. With plenty of natural ingredients available at your home, you can avoid the commercial and expensive treatments for healing the acne scars. A regular massage of the affected and scarred region with your fingertips for at least thrice a week (for 20 minutes each time) using the above-mentioned ingredients may reduce the intensity and lighten them. All the above-mentioned tips can be considered as the best home remedies for acne scars because of the scientific evidence which proves their natural effect on our skin. But, consistency is a matter of concern and you must not break your regime. If you feel that the scars are too intense and they cannot be treated by following the natural remedies, you can speak to your dermatologists to find out which treatment suits you the best. There is no single treatment for all acne scars. Depending on your skin type and the intensity of your scars, your dermatologist may suggest one of these treatments. Soft tissue fillers are injected to remove wrinkles, smoothen the skin, improve the skin texture and to remove unwanted scars. A collagen stimulating chemical is injected into the skin to improve the elasticity of the skin and eradicate the imperfections. The injection can also be made up of hyaluronic acid which is a naturally occurring skin component that is responsible for lubricating, moisturizing and retaining the water content in the skin. Bruising, redness and swelling are the aftermaths of the treatment. Laser treatment can lighten the scar and in some cases, may help in the complete diminishing of the scar. The treatment involves the passage of laser beams into the skin to remove the dead and damaged cells or to stimulate the production of new cells. Laser treatment is not implemented at a single stretch and you may have to make several visits to the clinic so as to obtain a clean and clear skin by the end of the treatment. 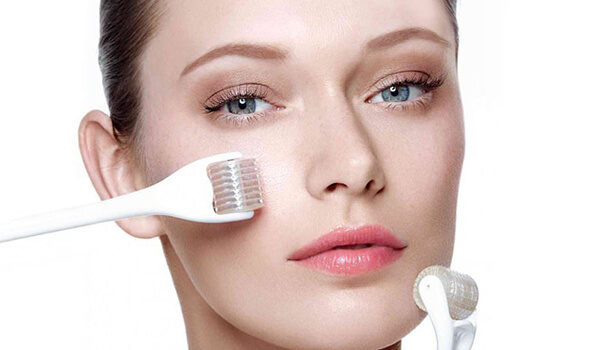 Micro-needling, as it may seem to hear, is not a painful process but is also not too good to experience either. The process involves the rolling of needles over the skin so that the collagen bundles that are present at the top of the dermis are broken down which are the prime reason for the emergence of scars. The production of collagen is further boosted due to the process of micro needling so that the skin appears smooth, even and devoid of scars. You can also perform micro-needling at home, but it is always best to consult a dermatologist before you actually jump into the process. Botox injections are a temporary way of healing the scars since the result may not last for more than six months. The injection is given to reduce the pulling of the wound which is the main reason for the appearance of scars. Botox injections can weaken the muscles, thereby reducing the pulling of the wound which eliminates the scars. 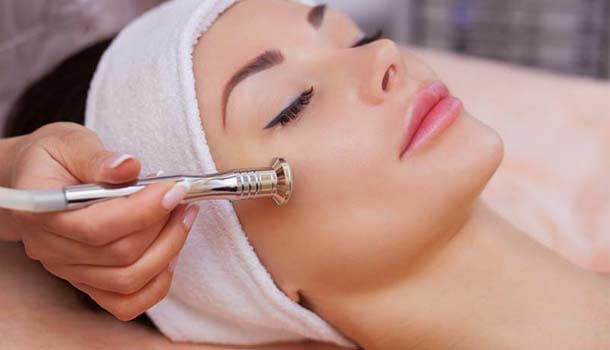 The process of dermabrasion is performed not only to remove acne scars but also to eradicate marks or scars that have emerged due to various other reasons like accidents or injuries. The process involves the removal of the scarred layer of the skin by using an instrument which further leads to the development of a new layer of the skin without any spots, scars or pigmentation. However, dermabrasion is not suitable for people with darker skin complexion since it can result in skin discolouration. There are various commercial methods that can help you get rid of acne scars as mentioned above but some of these just show a temporary result. Based on your skin texture, the severity of the acne scars, your skin specialist may recommend the suitable treatment. The treatments are expensive and require you to spend some time at the clinic since the treatment may have to be performed at various sessions and is not a onetime process.